By: Gary W. Moselle, Esq. Covers all the likely sticking points. Construction Contract Writer is an interview. Answer the questions to create contracts as detailed or as simple as the project requires - anything from a small home improvement job to a major commercial project. When your client signs the contract, re-open the original prime contract. Then click to turn that contract into a subcontract which mirrors precisely the provisions in your agreement with the property owner. No more relying on "flow-down." You get a custom-built subcontract based on provisions in the prime contract. Maybe best of all, Construction Contract Writer explains in plain English what you need to know before answering an interview question. Want a balanced and fair contract? That's easy. Want to draft a contract that protects the property owner? Need an aggressive contract that pushes the limits? Construction Contract Writer will do that too. Don't let others stack the deck against you. Control the contract and you control the bottom line - the profit built into each job. Give every prospective client a perfectly crafted, custom contract ready for signature. Your contracts have to change to stay in compliance. That's why Construction Contract Writer includes an "Update" button. You'll be invited to click "Update" when a change affects the contracts you're drafting. A connection to the Web is required. The first year of updates is included with the purchase price. Click the "Get Help from an Attorney" button on the Construction Contract Writer help menu to get answers from an attorney on staff at Craftsman. No charge. No limit. Expect a response in 24 hours usually sooner. 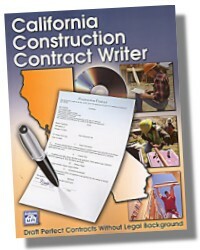 The California Construction Contract Writer disc. Instructions for installing and using California CCW. Sixteen printed forms ready to copy and use on your jobs. A summary of important features in each of the 16 forms. 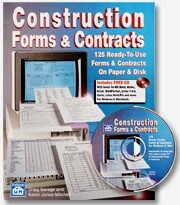 The 16 sample forms ready to install to your computer.